Investment in infrastructure is vital for cities to function and prosper. But many local governments struggle to finance large infrastructure projects while a huge proportion of their residents live in poverty. Two pioneering cities – Hyderabad and Kampala – have successfully experimented with new ways of raising money, offering promising lessons for cities around the world. Hyderabad has long struggled with congestion. Regularly paralyzed by gridlock, commuters are stuck for hours while the city’s air pollution has exceeded the notoriously toxic Delhi. To clear the roads and the air, the city is urgently trying to move people out of private vehicles and on to public transport. In November 2017, Hyderabad opened its new metro. The decision to build it was both crucial and brave. Railways are notoriously expensive and difficult to construct. 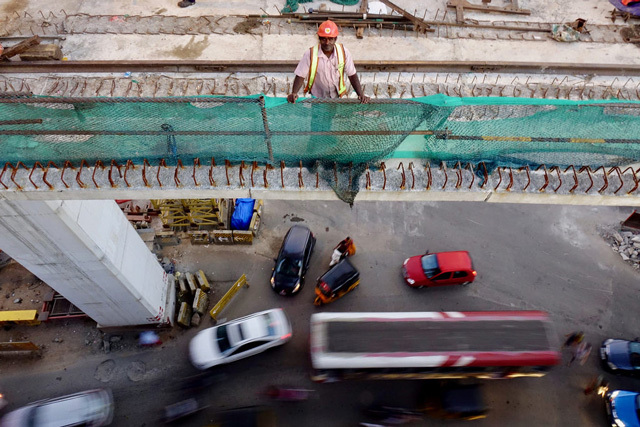 The Hyderabad Metro was expected to cost ₹14,132 crore ($2.2 billion) – a steep bill to pay in a city where one in four people live in informal settlements without clean drinking water, reliable toilets or decent housing. A new working paper from the Coalition for Urban Transitions, “Financing the Urban Transition,” explores how countries and cities can enhance their financial maturity. It shows how countries need to undertake different reforms and activities to build their skills and credibility with investors. This is essential for governments to raise money for essential public services, such as electricity, housing, transport and sanitation. But in the last few years, the municipal government transformed its tax collection system. Kampala invested in a new software called eCitie, which allows matatu drivers to pay their fees using their mobile phones. It’s quick, easy and provides proof of payment to any passing inspector. But it isn’t only matatu drivers who are benefiting. The city government can now collect payments for business licenses, hotel taxes, ground rents, property rates and market charges online. In five years, it tripled revenue from its own sources. This original version of this article was published on Zilient. Sarah Colenbrander is a senior researcher with the International Institute for Environment and Development (IIED) and senior economist with the Coalition for Urban Transitions. Denise Chan is a senior associate in PwC’s cities and urbanization team. The working paper, “Financing the Urban Transition,” was prepared for the Coalition for Urban Transitions by the London School of Economics and PwC.